Replica of a new series of low-budget rifles one of the most popular Chinese manufacturers in the world - CYMA. The rifle offers the same things as the other products of that manufacturer (metal gearbox and other mechanical parts), but thanks to the use of high-quality plastic in place of elements made of metal (eg. 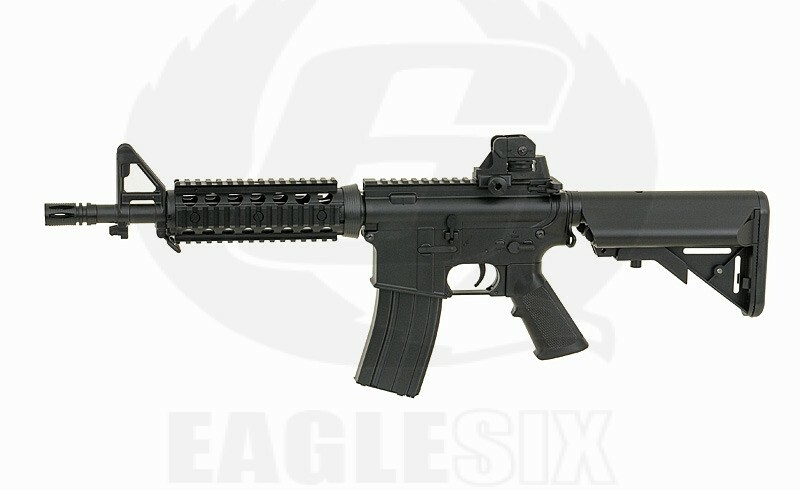 body, handguard, front/rear sights, buffer tube, flash hider, magazine) allowed reduced the price. Now, every beginner will be able to afford to buy their favorite rifle and start the adventure with ASG with reliable replica for lower price. This gun has been tested at 360 FPS. Please choose a Downgrade option if you would like it downgrading to less FPS. Please contact us if you need another FPS figure attaining fire a test of the gun, remember we do sell and restock guns all the time we will try our best to keep on top of the variable nature of china guns FPS that we stock. Please note - Although this set comes with a battery and charger we highly recommend you buy a proper IMAX charger available HERE and a decent 7.4v lipo battery to power this gun. If this item is out of stock at the time of your order we apologies, unfortunately we can not stock every RIF as a smaller airsoft store, it will default to back order from our suppliers. Allow we are well aware we live in a world of instant gratification nowadays, some customers want to use us due to are high levels of support especially with parts and customer service, so are happy to wait for us to source the gun. The add to cart button should change to pre-order when out of stock, and below it will be an estimation of how long it will take to source the gun from the supplier assuming they have stock.